Clean and devein shrimp, rinse well and set aside to drain. Place 2 T olive oil in large fry pan or wok. Heat to medium-high heat. Add onion and bell pepper to the fry pan and saute for about 3 minutes or until the large chunks of pepper soften. Add shrimp, sprinkle with salt and pepper. Add juice of 1/2 lemon and the zest. Add 1/4 tsp. of zest from the peeled ginger. Fry the shrimp, for about 3 minutes, make sure to stir and turn the shrimp. 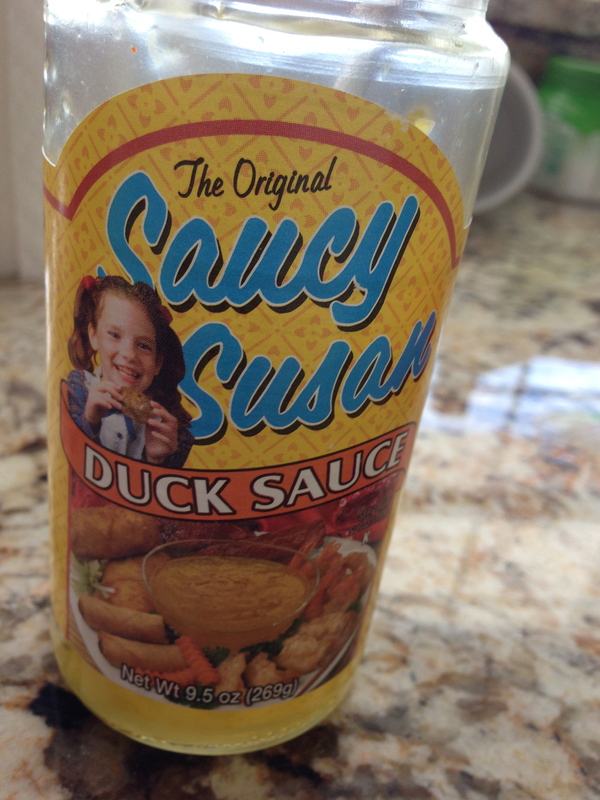 Add the jar of Duck Sauce, stir. Add the container of fresh chunk pineapple, stir. Add splash of soy sauce, and more salt and pepper to taste. Saute for 2 minutes, blending well. Serve along with fried rice and top with chow mien noodles. 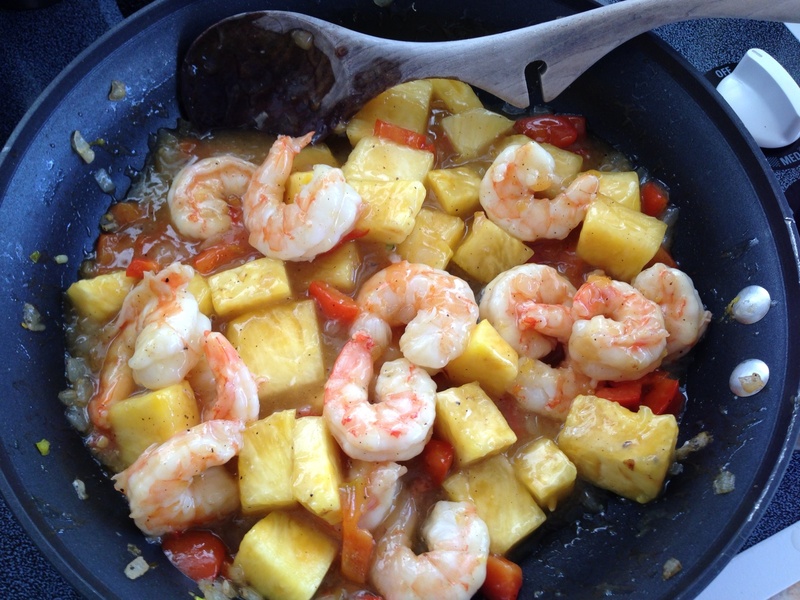 IMPORTANT: MUST SERVE THIS IMMEDIATELY, PINEAPPLE IS AN ACID AND WILL MAKE SHRIMP (OR CHICKEN) MUSHY IF LEFT TOGETHER TOO LONG! Add olive oil to medium fry pan. Add bell pepper and onion and saute for 3 minutes. Add cooked rice (use leftover or make fresh, can even use package microwave rice). Fry the rice for about 2 minutes. Move rice mixture to one side. Scramble two eggs, season with salt and pepper and fry in fry pan, stirring to cook the egg. 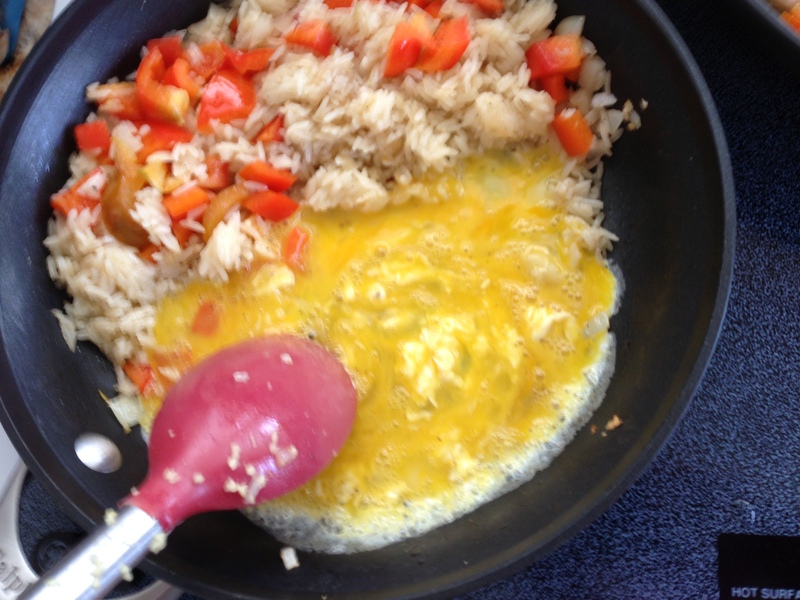 Mix the cooked scramble egg into the rice mixture. Add frozen peas, large splash of soy sauce. Season again with salt and pepper to taste. Mix well and cook for an additional 2 minutes to blend. Note: You can make this same recipe with chicken, just use cut up chicken breast instead of shrimp and saute it longer! 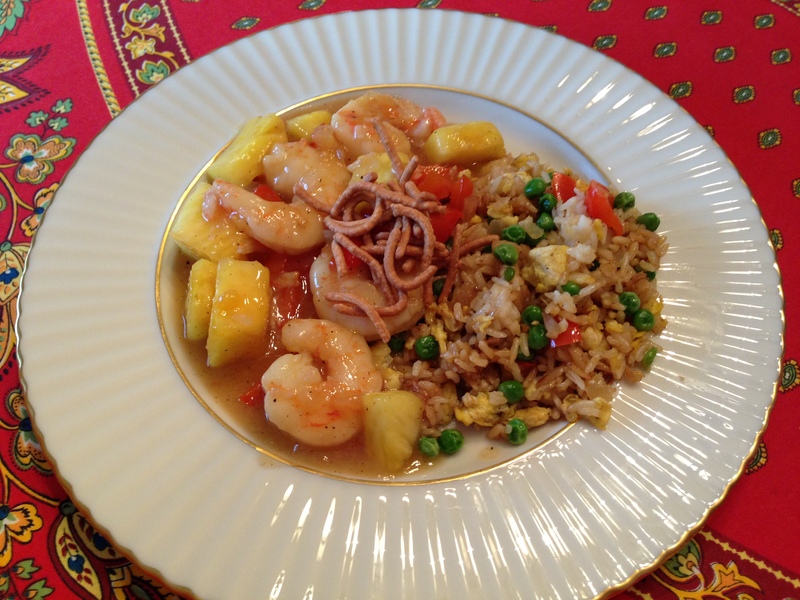 This entry was posted in ENTREES and tagged easy sweet and sour shrimp, fried rice, oriental food, quick shrimp, RICE, semi homemade shrimp, SHRIMP, sweet and sour shrimp, tasty shrimp. Bookmark the permalink. Looks delish! Making me hungry!! Thanks Rita! I appreciate your comments!